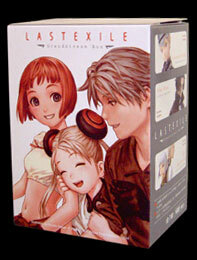 Last Exile was one of my favourite anime series of the last few years, and one of the main reasons why was the stunning art and design from artist Range Murata. Several figure ranges have been based on Murata's artwork, particularly that from his 'PSE' artbooks and the Robot manga anthology, but this is the first I have seen for Last Exile. This range consists of seven figures, five of which are busts of characters from the series, the sixth a figure of the character Alvis E Hamilton and the seventh a scale model of Claus & Lavie's flying Van Ship. The figures all come 'blind boxed' meaning you don't know which you have until you open the box. However, whichever you get isn't really important, as they're all superb. 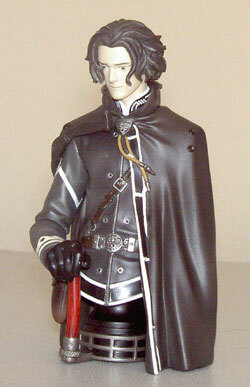 The busts all stand at around 3" (7.5cm) tall and come fully painted with no assembly required. The characters represented by the busts are lead characters Claus Valca and Lavie Head, the Captain of the Silvana battleship Alex Row, ace fighter pilot Tatiana Wisla, and finally Guild member Dio and his bodyguard Lucciola (standing back to back as a single bust). The sculpting and detail on each one is absolutely stunning, and the painting is of a much higher standard than you often get with these kinds of figure. The same is true of the Alvis statue, which is probably the best figure in the range, and the Vanship model. The sculpting captures the characters absolutely perfectly, they look so good they could have jumped out of the Range Murata paintings that inspired them. It is very rare for a designer's artwork, particularly artwork as distinctive as Murata's, to be captured so well, but somehow they've managed it. Each figure is instantly recognisable and they look better than many figures twice their size. Blind boxed figures in Japan are usually decent quality, but I don't think I have seen better ones than these. Great care and attention appear to have been taken to ensure authenticity and it really shows. Everything from the facial expressions to the clothing and pose is brilliantly depicted, just look at the picture! I was really impressed by this range (as you probably guessed), each figure in it looks great and I only wish I had bought more. At the Japan Ex the figures cost £5 each, which is about what you'd expect to pay after import duties, and they were well worth it. These Last Exile figures are a must for every fan of the series and Range Murata's artwork and I cannot recommend them highly enough. Superb. Sadly none, apart from stands that are part of the figures themselves, and a nice box.